The 80's was a sort of a miracle decade -- There are at lease three big discoveries which change notion of scientists. One is well known, the high-Tc superconductivity, and one another is also well established, the C60 (AKA fullerene). The importance of these two discoveries are apparent, even by viewing the fact that the Nobel prizes are given to them shortly after their discoveries. The third one is quasicrystals. The quasicrystal was first found in a splat-cooled Al-Mn alloy by Shechtman et al. in 1982. The quasicrystal is a novel form of solids, which shows very high structural order, nevertheless they do not possess periodicity as ordinary crystals do. This can be most easily seen in diffraction patterns of the quasicrystals. As seen in Fig. 1, the electron diffraction patterns exhibit the icosahedral symmetry -- a regular polyhedron with 20 faces --. Fig. 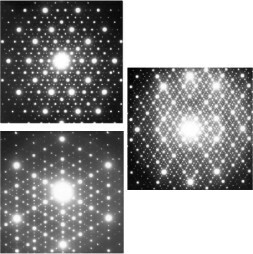 1: Electron diffraction patterns of the icosahedral Zn-Mg-Ho quasicrystals. Fig.2a: Square lattice in the 2D plane; you can fill the plane with no gap. Fig.2b: Pentagons in the 2D plane; can you fill out the plane? The discovery of the quasicrystal was simply revolutional in the crystallography, and an intensive exploration has begun; there are plenty of findings in this quasicrystal research field, nevertheless, yet achieved to the goal. So no Nobel prize yet. Your chance, isn't it? Metallurgy of quasicrystals by A. P. Tsai. Quasicrystals -Introduction by R. Lifshitz. Quasicrystals by P. A. Thiel. Give me just a little moment, please.